Whether it’s for spring break, summer vacation, or just a trip into the wild, a backpack is a fabulous choice for traveling. They’re versatile and easy to carry through crowded airports or secluded forests. What’s the best backpack for traveling? Read on to find out. The answer to the question, “What’s the best backpack for traveling?” depends on where your next adventure will take you. If you’re going on a classy European tour, the backpack you get for fashion-conscious Barcelona may not work on a through-hike on the Pacific Crest Trail. If your trip involves plane travel, the size of your backpack is very important. If you want to keep your backpack as a carry-on item, check with your airline carrier about physical size restrictions. TSA Travel Tips provides a helpful overview of TSA luggage restrictions. Many airlines prohibit backpacks beyond a certain size, so it’s wise to check first. The more you carry your backpack, the more weight matters. In an airport or on a sidewalk, a backpack with wheels takes the weight literally off your shoulders. However, if you’re long-distance hiking over rough mountain terrain, you want the lightest backpack you can get. Depending on where you’re going, the features your backpack offers can be crucial. 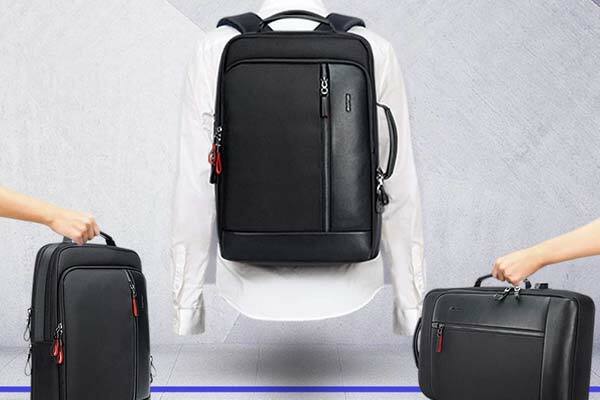 Do you need a waterproof backpack with lots of compartments for hiking, or a sleek and fashionable model with a laptop compartment for business travel and interviews? What’s the best all-purpose travel backpack? We all need to get places, and a backpack is a terrific choice for a travel tote. For an all-purpose travel backpack, be on the lookout for durable construction and airplane size limit compliance. Above all, don’t pack too much. As travel expert Mapping Megan points out, sometimes less is more when it comes to traveling with one backpack. The Osprey Farpoint 40 Travel Backpack is a backpack that’s classy and understated enough for everyday travel but durable enough to take on a weekend hike. Built to meet the carry-on requirements of most airlines, the Osprey is built around a LightWire frame suspension. A hip belt transfers most of the weight off your aching shoulders and onto your hips for easy carrying. The Osprey also features a mesh back panel to improve cooling, padded handles, and a zippered front panel for extra storage. Some design decisions make the Osprey Farpoint 40 Travel Backpack less easy to use. The front compartment is hard to access if the main compartment has been filled, and objects may be hard to put into the pockets. The straps on the front make it difficult to get into the pack. 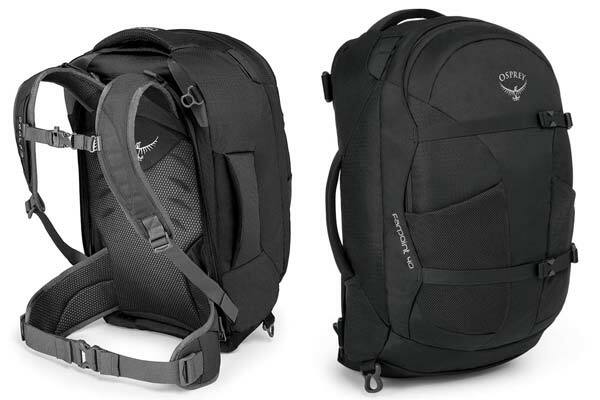 Bottom line, the Osprey Farpoint 40 is a smart choice for an all-around travel backpack. Made of water-resistant nylon, the Kipling Women’s Sanaa Black Rolling Backpack is a well-reviewed and popular travel backpack. The backpack comes with wheels and a retractable handle for easy transportation through airport security. With a front zipper and flap pocket, the Kipling is a practical backpack for travel or work. The Kipling comes in a variety of fun and classic colors and patterns. Some users have had difficulty in retracting the handle. Check the dimensions of the Kipling travel backpack to see if it’s sizable enough to meet your needs. The straps may be inconvenient while the bag is rolling. 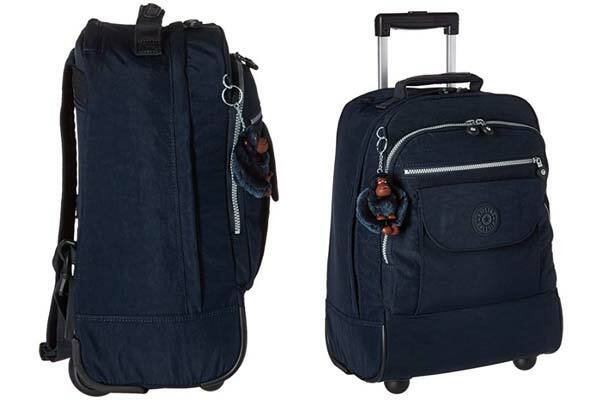 However, many users found the Kipling Women/s Sanaa Black Rolling Backpack perfect as carry-on luggage for short getaways or fun staycations. 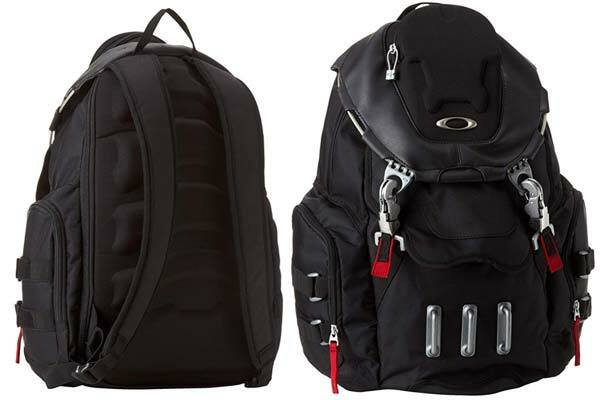 Let’s face it: With a name like “Oakley Men’s Bathroom Sink Backpack,” this travel pack is definitely worth an examination. You’ll love the no-holds-barred ruggedness of a pack with not one, but three metal carabiner handles on the outside and a double metal front closure. Made of sturdy nylon and designed for style, the Men’s Bathroom Sink offers a clever design that deters theft and provides good storage. The Kitchen Sink backpack could use a handle on top for easy grabbing, and the side pockets are on the small side. Though the bag definitely deters theft, it’s somewhat difficult to quickly access your belongings inside. For style and function, the Men’s Bathroom Sink Backpack is a bag to consider. What’s the best backpack for business travel? Packing for a business trip, as this helpful video by Mr. Porter demonstrates, is an art in itself. This is especially true when you’re planning to fill only one travel backpack. For business trips, making the most of your space is almost as important as having a professional appearance. A stylish, classic design that doesn’t look out of place in an executive boardroom is crucial. Overall, your backpack should include a laptop compartment to fit your computer. Make sure your laptop is easily accessible for airport check-ins. Multiple compartments to separate files, papers, and travel documents are a must. Here are some real winners. This bag, by Temporary Forevers, is notably elegant and versatile. Made of full-grain Italian cow leather with removable straps, this bag can be easily converted from a backpack to a messenger bag or a briefcase. 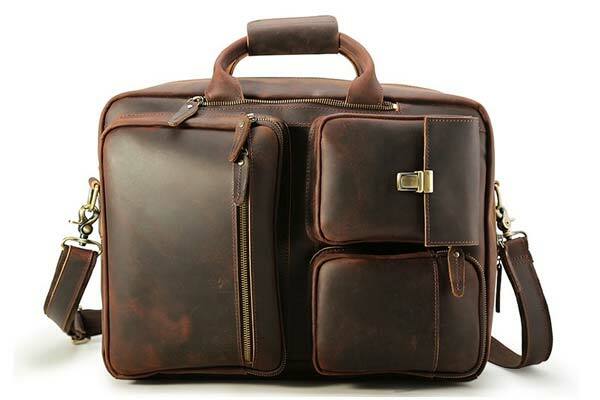 Its classic design includes an expandable compartment for additional gear and a 15″ laptop pocket. With its Italian leather and attention to detail, Temporary Forevers bag is among the more costly of the travel backpacks featured. Some users felt the zipper needed to open and close more smoothly. The front pocket does not easily accommodate the straps for using the bag as a messenger or briefcase. For classic professional style, the Temporary Forevers 48-Hour Switch Leather Bag is worth a look. The Bopai Intelligent Increase Anti-Theft Backpack is geared toward practicality. A rugged pack made of water-resistant leather and nylon, the Bopai backpack includes a number of thoughtful details. The pack includes a 15.6″ laptop compartment, an invisible zip pocket for valuables like a passport or phone, and a USB charging port. Some users felt the Bopai needed a front sternum strap to hold the backpack securely in place. Other users had occasional difficulty getting the front zipper to close smoothly. Many users appreciated the style of the Bopai Intelligent Increase Anti-Theft Backpack regardless of some minor issues. The Tiding Vintage Genuine Leather Convertible Backpack is a stylish choice for business travelers who love the vintage look of distressed leather and pockets with retro metal clasps. With a classic Indiana Jones vibe, this backpack easily converts to a messenger bag or briefcase. The Tiding backpack features three front pockets for important smaller items like your phone, wallet, and travel documents. The Tiding also includes a padded 15.6″ laptop compartment. Breathable mesh on the back helps make this pack comfortable to carry. Thick, full grain horse leather and strong stitching provide durability. Some users found the zipper placement on the front pockets inconvenient to use when they used the bag as a briefcase. The zipper on the front pocket does not extend around the left side. The manufacturer cautions users to break in the backpack by wearing dark clothes with it for a week or two. 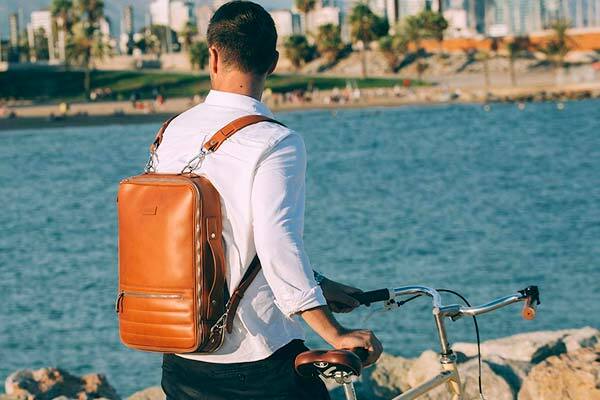 The dye used for the leather may initially rub onto clothes for a short period of time until the Tiding Vintage Genuine Leather Convertible Backpack becomes more seasoned. What’s the best backpack for long-distance hiking? 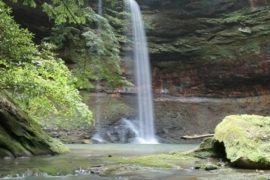 Long-distance hiking is a whole new game in the world of backpack travel. If “stylish and sleek” were two important factors for a business backpack, the features to look for in a backpack for hiking travel are “light and durable.” If you’re going to carry a backpack from the Mexican border to Canada, you want to forget you’re carrying it. 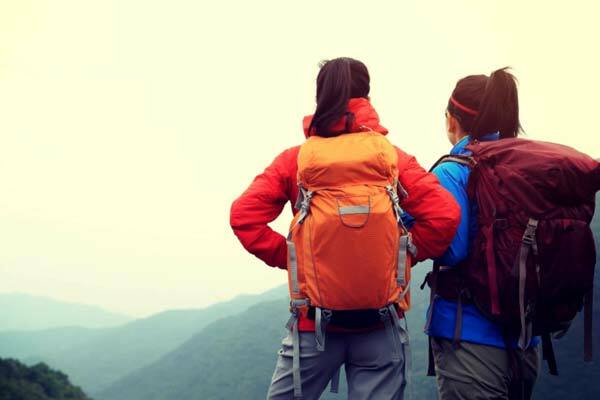 Look for weight, fit, and ease of use with these hiking backpacks. You want to aim for a backpack that weighs less than two pounds. More than that, and the padding and extra ounces will be a hassle for long-distance hikers. For a good capacity, choose a pack between 40 and 65 liters. It’s tempting to get a bigger backpack, but that space can be too easy to fill with heavy gear. Here are some solid choices. 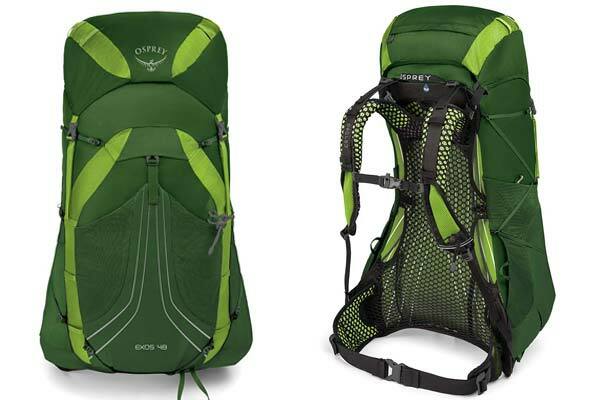 At 2 pounds, 10 ounces, the Osprey Exos 48 isn’t as ultralight as a cuben fiber pack. However, the Osprey Exos is affordable and comfortable. The pack’s outstanding ventilation and sturdy frame are well-designed features. Some users prefer the accessibility of a pack with a hip belt, but overall, the Osprey 48 is a good pack with a 48-liter capacity. The Osprey also comes in a larger 58-liter model. Some users found that the Osprey worked best when it was loaded with less than 25 pounds of travel gear. However, over that weight limit, the bag tended to chafe. Other users reported problems with the frame of the Osprey squeaking when they moved. The smaller pockets open on two sides may put items at some risk of falling out. Overall, though, the Osprey Exos 48 was a good backpack for a somewhat smaller hiking load. A solid contender for a long-distance hike is the Granite Gear Crown 2 60 Backpack. Weighing two pounds, five ounces, the Granite Gear Crown 2 has interior dimensions 23.5″ X 13″ X 8″. Ultralight packers will love the adjustability of the Granite Gear Crown 2’s removable frame sheet, removable top compartment lid, and removable hip belt. A roll top allows for considerable versatility in packing your gear. This pack easily accommodates a bear can canister under the lid. Other than feeling that the water bottle holders could be more conveniently placed, there were very few negative reviews about the Granite Gear Crown 60. Some users may find the light brown or light khaki colors of the Granite Gear Crown 2 60 Backpack to be somewhat limited or unexciting. On a long-distance hike, however, practicality is a priority consideration. 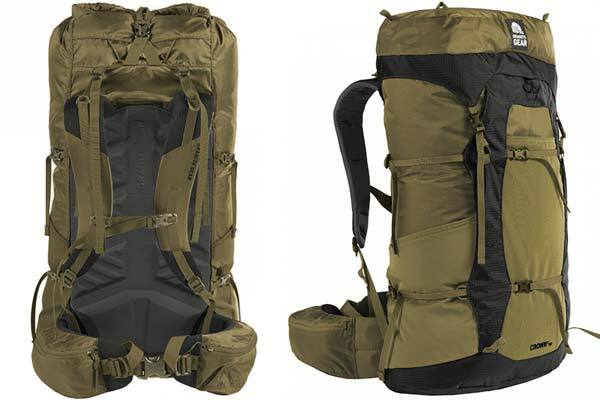 This 35-liter “fastpack” by Ultimate Direction puts lightweight design front and center. 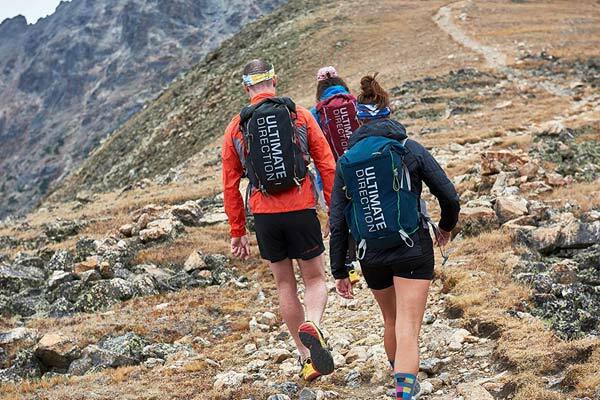 The Ultimate Direction Fastpack is one of the few designed specifically for multi-day running events. It’s a hybrid between a running vest and an ultralight backpack. The Ultimate Direction features easily-accessible front pockets for water bottles, snacks, phone, or maps. Some users felt that the hip belt in the Ultimate Direction Fastpack did not support enough of the backpack’s weight and fit awkwardly. Always consult the website’s sizing directions and be sure of the product’s return policy. The placement of the water bottle pocket was too high for some users. Be aware of the fact that this is a pack specifically intended for long-distance trail runners. The carrying capacity of this pack is probably less than most ultralight packs. Overall, the best backpack for traveling is the one that checks all the important boxes for you personally. Materials, cost, durability, weight, and storage capacity are important features to consider whenever you make a purchase. Wherever your travels go, a great pack will help you get there in style.